A special treat for lovers of ballet on the French Riviera, with the Kremlin Ballet Theatre’s performance of Esmeralda in the Acropolis in Nice. You may have followed the story of Victor Hugo’s beautiful heroine Esmeralda on the screen, either the Disney version, or one of the many adaptations of the famous novel ‘Notre Dame de Paris‘, or you may have read the book. Now you will be able to see it performed live on stage when the Kremlin Ballet Theatre from Russia comes to Nice on the 17th of March for one unique performance of the ballet of the same name. Set in 15th century Paris, the storyline remains quite true to the original plot, as three men from different walks of life, the hunchback bell ringer Quasimodo, his adopted father Claude Frollo, a priest, and Phoebus, the captain of the King’s archers, compete to win the heart of Esmeralda, a beautiful and alluring gypsy. Victor Hugo has always been known to bring out romantic feelings in his depiction of human relations, and the ballet is therefore much more than just a simple love story. With its tight dramatic structure and an emotionally charged plot, it highlights the conflicts that existed between the church, government and the common people in medieval times. The most famous ballet version of the story was choreographed by Marius Petipa in 1886, with a score composed by Cesare Pugni, and one of its most famous scenes is the ‘Diane and Actéon Pas de Deux‘, when Phoebus’ fiancée, Fleur de Lys, learns of his feelings towards Esmeralda. This classic ballet pas de deux is now a regular feature at various competitions and galas by ballet companies all around the world. Audiences outside Russia hardly ever get to see this ballet, so don’t miss this extraordinary chance to discover it for yourself! 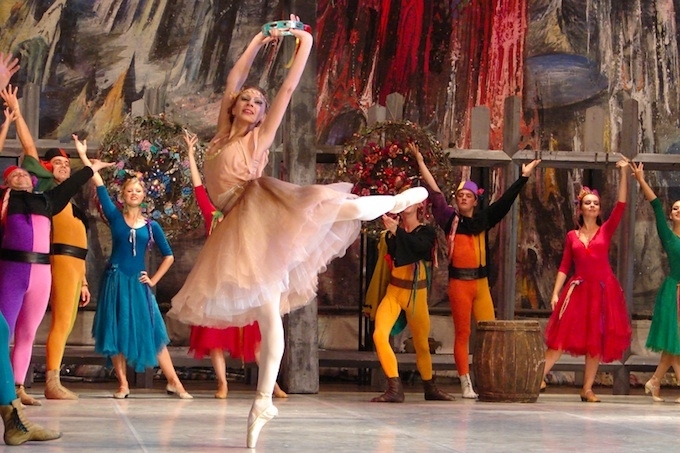 The Kremlin Ballet Theatre performs at the Salle Apollon at the Acropolis in Nice on Sunday, 17th March at 3:30 pm. Tickets range in price from €39 to €62 and may be purchased online or through the usual outlets.